It was supposed to be a simple job. Test an experimental folding drive to travel beyond the fringes of explored space. Return safely for a big payout, and retire on small colony to never be heard from again. Things don’t always work out as planned. On the return trip, something followed you back. Something ancient. Now it’s a race to make it back to Earth before the ancient alien threat wipes out everything in its way - including you. To make matters worse, it won’t be an easy journey back to Earth. There's danger at every jump on this side of the galaxy. Ruthless pirates, lethal robots, and deadly aliens all stand in your way. You and your friends will tour the sector, upgrading your ship, stockpiling weapons, and fighting for your lives. From the creators of Game Informer’s 2016 VR Game of the Year, Chronos. 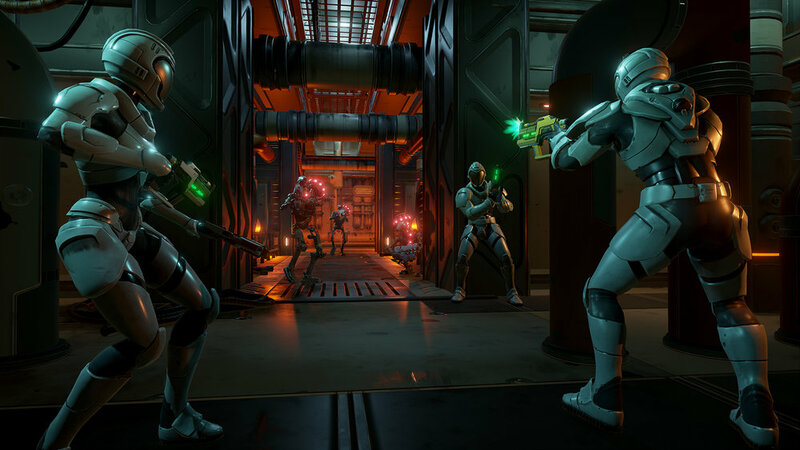 From Other Suns is an action-packed co-op VR space adventure designed from the ground up for the Oculus Touch. Co-Op or Single Player – Built for 3 player drop-in co-op action or a great solo experience. Be the captain – Manage your own ship and its crew, upgrade your systems and weapons while negotiating with merchants and avoiding pirate raiders. Randomized Universe – No two playthroughs are the same! From encounters to locations, never have the same experience twice. Rogue-lite – Run out of crew members and your mission is over! A running tally of achievements allows you to work towards unlocking powerful weapons and better ships, allowing you to progress further on each subsequent playthrough. Available Fall 2017 for the Oculus Touch!